Coastal regions in the U.S. are more popular—and more heavily populated— than ever. But even before the effects of global warming started to kick in, reports the non-profit World Resources Institute, more than half of the coastal ecosystems of the world—including the vast majority of America’s coastlines— were reeling from threats including habitat destruction, sewage outflows, industrial pollution and the impacts of non-native species introductions. Recently, though, a string of unprecedented natural disasters, including hurricanes like Katrina and tsunamis like that which devastated Japan, has made many people re-think the wisdom of moving to the coast. And the federal government has begun to advocate that coastal communities adopt tougher building codes and zoning ordinances, but there is little public officials can do to deter people from being drawn in by the lure of the coast—even as ice caps melt, sea levels rise and storms brew fiercer and fiercer. Critics say the federal government should be doing more to protect coastal areas which, besides being attractive to home buyers, are among the richest storehouses of biodiversity we have. But traditionally, such responsibilities have fallen to local and regional officials. 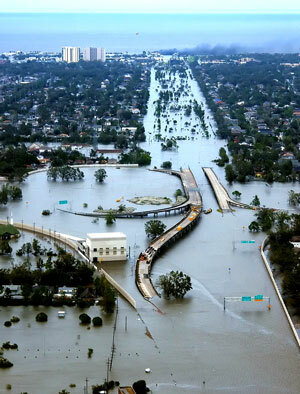 In the case of New Orleans following 2005’s disastrous hurricane season, the Louisiana state legislature formed the Coastal Protection and Restoration Authority (CPRA) to protect, conserve, restore and enhance coastal wetlands, barrier shorelines and reefs so as to protect the city from the impacts of future hurricanes. The U.S. Army Corps of Engineers is now working with Louisiana authorities to implement CPRA’s master plan. 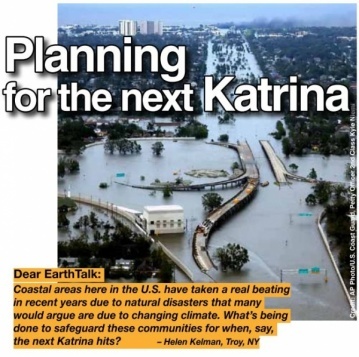 Of course, restoring wetlands and other natural buffers that have been decimated by a half century of development and overpopulation is no small task. It’s unfortunate that such plans only come to pass after a disaster of huge magnitude takes place, instead of beforehand. In response to such concerns, green groups, consumer advocates, taxpayer associations, insurance companies and other organizations have come together as Americans for Smart Natural Catastrophe Policy (also known as SmarterSafer.org). Coalition members, which include the Sierra Club, Liberty Mutual Group, Americans for Tax Reform, the United Services Automobile Association and others, have aligned behind shared goals of restoring coastal wetlands and increasing protection for barrier islands while influencing local officials to make smarter decisions about where to allow development in light of the expected effects of climate change and other problems. CONTACTS: CPRA, www.lacpra.org; Smartersafer.org, www.smartersafer.org. EarthTalk® is written and edited by Roddy Scheer and Doug Moss and is a registered trademark of E - The Environmental Magazine (www.emagazine.com). Send questions to: earthtalk@emagazine.com. Subscribe: www.emagazine.com/subscribe. Free Trial Issue: www.emagazine.com/trial.